It’s a fact that energy makes our lives far more comfortable and in some cases, even safer. Preppers who are able to have a reliable source of energy during and after an unexpected event, will fare much better than those without. 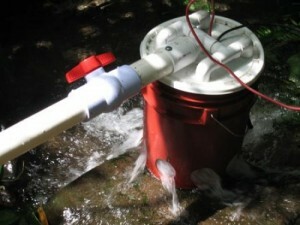 Hydro-power is one source of energy that may be available to some terrestrial-based Preppers. Of course water wheels have been around since the Greek and Roman days, so there’s nothing new about that. However with the latest technological breakthroughs in high-output, high-efficiency alternators and generators combined with the design innovations in Pelton wheels have created some cool opportunities for Preppers. If you happen to have a source of water (stream, pond, lake, etc.) and your power generating location is sufficiently lower in elevation than that source of water (downhill from the water source), you can tap into the available kinetic energy that is available and stored in that water. In simple terms; a column of water that is standing in a vertical pipe, produces roughly .43 psi per foot of standing-water in the vertical column. So if you have a vertical pipe full of water that is ten feet tall, the water pressure at the bottom of the pipe would be about 4.3 pounds per square inch (PSI). So, for example, if you can find a water source that’s 100 feet above the elevation of your location (uphill), and you ran a PVC pipe from that body of water and down that grade to the location 100-ft. lower in elevation, there would be roughly 43 PSI of water pressure at the lower downhill end of that PVC pipe. Obviously, unless the source of water is above your location on the top of a cliff, there will be some form of grade over the decrease in elevation, meaning, you would have to run much more than 100 feet of PVC pipe. So if you ran 1,000 feet of pipe to make the 100-foot drop in elevation that would be a 10% grade. Regardless of the grade of the hill, the pressure developed is a function of vertical drop, so in our example, where the grade was 10%, and we ran 1,000-feet of PVC pipe over a change in elevation of 100-feet, the pressure at the bottom of that run of pipe would be about 43 PSI, and this water pressure can be converted into electrical energy! The diameter of the pipe used will affect how much volume can be delivered at any given pressure, so a larger diameter pipe on the example 10% grade (100-ft. drop in elevation) will deliver more volume at that same pressure. During the California Gold Rush back in the 1800s miners would use this principle (gravity water pressure) to run powerful water jets known as ‘monitors’ that were in fact so powerful you could hose-down the side of a mountain over time. 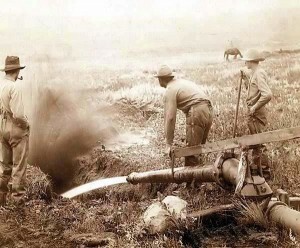 This process was called ‘hydraulic mining‘, and has since been outlawed in many places. The point being that, by having enough of a vertical drop in the column of water, miners were creating more than enough water pressure to move tons of dirt and rocks through their sluice-boxes. Many times, miners would build a large pond, or dam to hold accumulated rain water to power their hydraulic water jets. Preppers who have enough land with an appropriate grade (slope) could theoretically do the same at some scale. 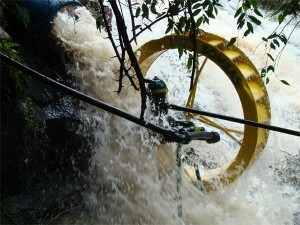 By using this available water pressure, it can be directed using one or two nozzles to spray against a compact water-wheel (Pelton Wheel) and that will cause that wheel to spin with enough force to drive a generator or an alternator, thus converting kinetic energy from the water into electrical energy. Back in the 70’s I helped some friends build a water-wheel that used the rear-end out of an old ford truck to drive a 12-volt permanent magnet generator salvaged off a big diesel engine out of a semi-truck. There was a lot of structure that had to be placed to secure the system along-side the creek. But generally; we welded a paddle-wheel frame to the steel wheel that bolted to the axle, which would normally have a rubber tire on it, and that paddle-wheel was driven by the force of the creek. On the end (pinion shaft) of the differential where the drive-line would have bolted-on, we had a large diameter pulley mounted that in turn drove another set of ratio-ed pulleys on another bearing-ed shaft, with the final pulley on that set driving the smallest pulley on the generator shaft. This setup required two V-belts and was too complicated in my opinion, looking back at it today. It made some power, but nothing like what can be done today. The truck differential we used had about a 4 to 1 ratio, meaning that for each full revolution of the water wheel that was driving the axle and ring-gear in the differential, the pinion gear that drove the primary pulley (where the drive-line normally connected) would make 4.11 revolutions. We liked the idea of the truck axle and differential because the main gears and bearings were running in an oil bath. There were other modifications to the differential; we only needed one drive axle, so we pulled the unneeded axle out of the housing and cut-off the axle tube on that side and welded a cap and mounting bracket on it. I also recall welding the spider-gears so the ring-gear would be locked to axle. I spent some time looking around the Internet and found a couple interesting links; one is a do-it-yourself water-turbine (Pelton wheel) system, and another system that could be used in a stream or as a wind-mill that uses a slow turning generator that looks to be very heavy-duty. Obviously, there are many other potential hydro-generation solutions. One of the major disadvantages is that these systems clearly are not portable, so if you are forced to bug-out from your location for whatever reason, you will do so without them, which is one of the disadvantages of sheltering-in-place. In the case of ‘Nautical Prepping’; our home and shelter is one-in-the-same and is also our bug-out-vehicle (ship). So the entire operation, including our solar and wind energy systems can relocate with us as needed, and can do so within minutes, to any location that is contiguous with the oceans of the world. Written by: William Simpson on November 3, 2013. Last revised by: , our reviewer, on November 5, 2013.